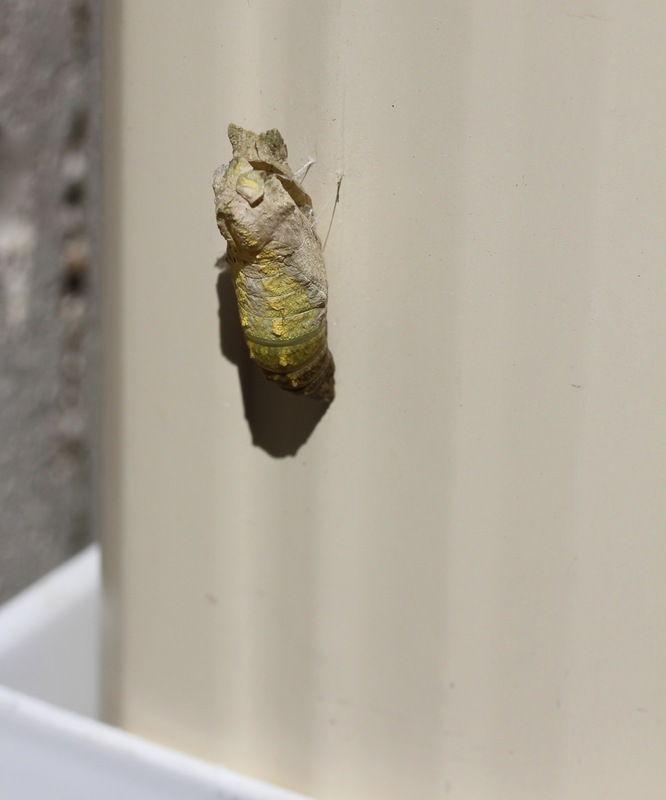 Of all places in the garden to attach a chrysalis, one of our black swallowtail caterpillars (Papilio polyxenes asterius) chose the smooth metal drainpipe along the side of the house. How the caterpillar bridged the collar with an opening to an underground drain, I can’t guess. But here is where I found the emerging butterfly struggling to gain a foothold on the smooth surface… and failing. It was in big trouble and I could tell it had been here too long with wings partly out and beginning to plump. I felt a little like a butterfly midwife as I assisted in the birth by offering a twig. It was readily accepted and it climbed aboard. I gently urged the butterfly onto a viburnum shrub and watched as she began to unfurl and pump up those gorgeous wings… that I believe identified her as female. It was exciting to be so close and be able to study the beautiful wings, her huge eyes, and watch her coil and uncoil her proboscis. Click for closeup. I left her on a trunk of the viburnum where she continued to dry and pump her wings. An hour later I checked and she had flown…. I hope straight to the summersweet for a nice first meal as a butterfly. It made me smile to think she got her start in the parsley beds 5 feet away that I planted just for her and her siblings. What’s all the frass about? I have always planted an abundance of parsley and dill in the spring… one clump for us and 3 or 4 for the butterflies. Not many butterflies have been fluttering through this neighborhood so I was overjoyed three weeks ago when I saw some frass or caterpillar poo beneath a big pot of parsley, the parsley we used for the kitchen! Immediately, I took the pot off the deck and placed it in a secure place in the garden. I knew exactly what caterpillar made this frass… the Eastern Black Swallowtail butterfly (Papilio polyxenes) that uses plants in the carrot family as hosts. 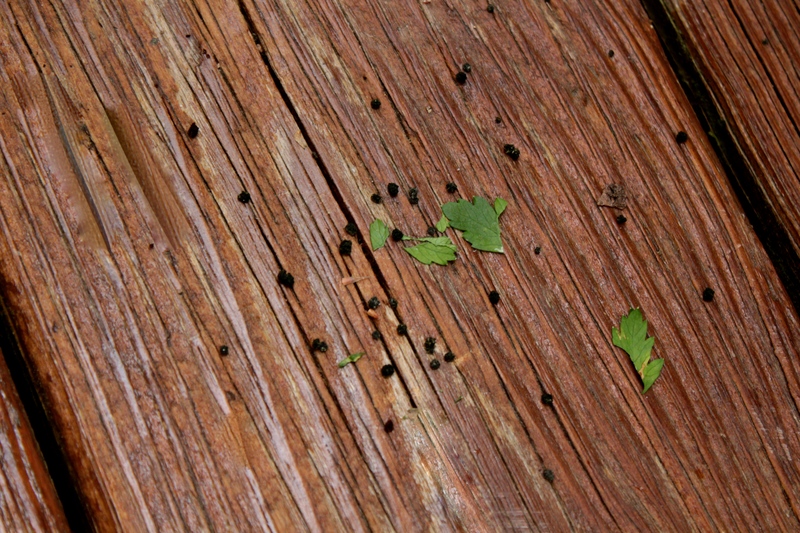 I spotted several tiny caterpillars on the parsley and watched them develop through several instars for about two weeks. Dainty but constant eaters, they almost cleaned out the potted flat parsley and moved on to curly parsley and dill in the garden. They were plump and beautiful and ready to pupate when we left for a week’s vacation. We returned home yesterday and I checked the parsley. All the caterpillars were gone, hopefully tucked securely in their chrysalis quite a distance from the host plant. How exciting to play a part in raising these beautiful butterflies! I keep checking for an egg, but unfortunately no monarch butterfly has visited their host plant in our garden, butterfly weed (Asclepias tuberosa). 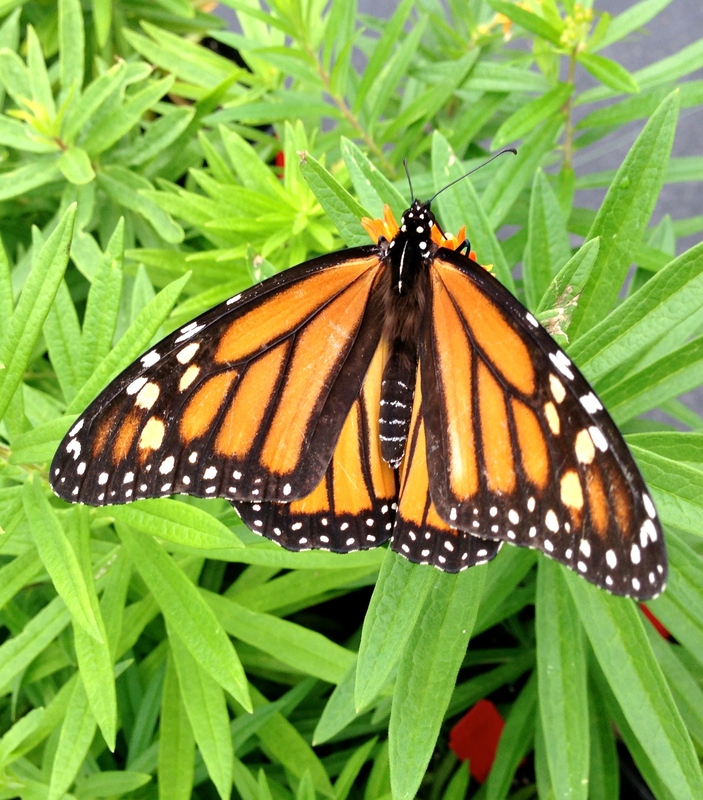 At Rolling Green Nursery where I work, I have seen a few monarchs feeding on butterfly weed we have for sale. Let’s hope the female below left an egg on the plant. Just seeing the insect is encouraging for our diminishing population of monarchs. If you are a good host and your invited dinner guest is the Eastern Black Swallowtail butterfly, there is a set menu you should provide. Your guests, male and female, will arrive dressed in sleek formal black with tails. Adorning the outfit of the female are bright yellow markings and a row of iridescent blue spots between rows of yellow spots at the base. The male will have a yellow band near the edge of the wings. Completing the look is a dashing red spot on each wing that forms a dot when the wings touch. We have all have seen the fetching Eastern Black Swallowtail merrily dancing in our gardens amongst the nectar plants like phlox, thistle, butterfly bush and purple verbena but to encourage these lovelies, your party should include host plants as well. Host plants in the carrot family include parsley and dill, fennel, rue, carrots and Queen Anne’s Lace. My butterfly rule of thumb is one plant for me and two for my guests. Dill and parsley grow in sunny beds around my day lilies, my roses and peonies, forming a green and airy foundation for any plant. Butterfly eggs are laid and eggs hatch. 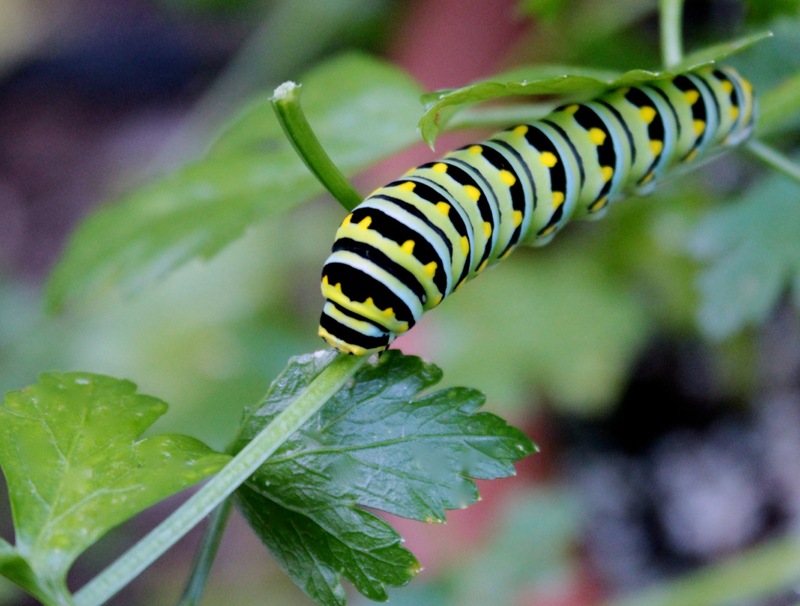 In no time you will see the young caterpillars in vibrant stripes of black, chartreuse, cream and yellow. Up one stem of parsley and down another they go. Eat is the name of the game and molt is what they do to fatten up. Parsley disappears and dill disappears but, not to worry, the damage is fully cosmetic. The plants recover. Soon the plump youngsters are ready to pupate, form a chrysalis, and within 1-2 weeks, an adult emerges fully dressed for the next party. 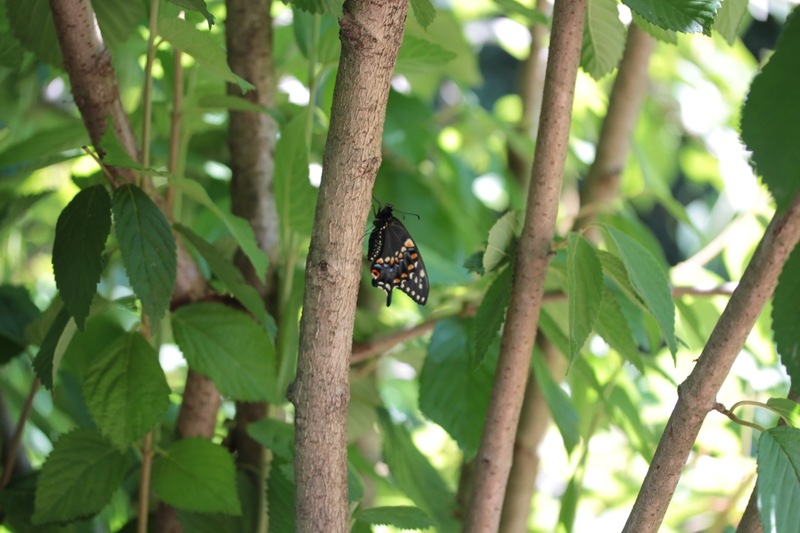 Providing a habitat for the Black Swallowtail is fun, easy, educational and good for the garden. It’s time to stop squishing those parsley caterpillars and share the abundance of nature. 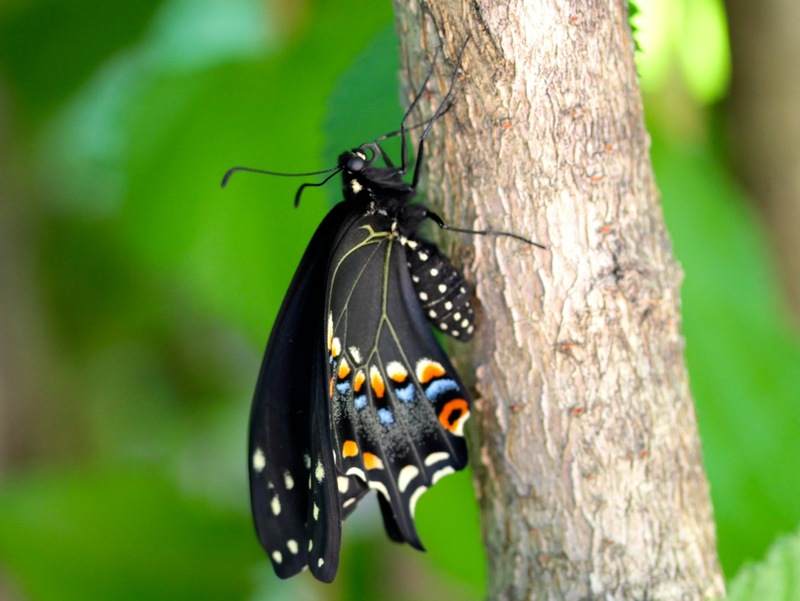 Be a good host to the Black Swallowtail butterfly.